"ZeTime is the first hybrid smartwatch with mechanical hands over a full round color touchscreen. 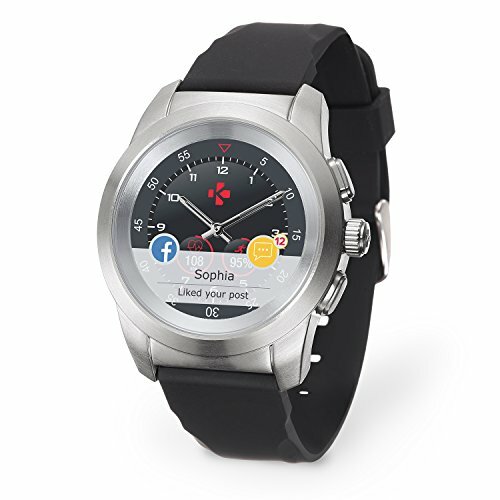 Its smart movement technology positions the hands horizontally when you read notifications. ZeTime automatically update the time, according to your location and work up to 30 days on a single charge. ZeTime: the world’s first hybrid smartwatch combining mechanical hands with a full round color touchscreen. Using groundbreaking technology to mount watch hands through the center of the high-resolution TFT color display, ZeTime blends the classic design of a traditional timepiece with the most advanced features of a smartwatch. With its proprietary smart movement technology, the CPU of ZeTime controls the mechanical hands. Both hands possess their own motor to move separately. When reading or browsing notifications the hands moves horizontally to maximize visibility on screen. Combining the best of traditional watchmaking and the full features of a smartwatch, ZeTime was designed with the intention of being worn all day and every day. Thanks to its mechanical hands, ZeTime automatically updates the time, according to your location and works up to 30 days on a single charge. So you won’t need to charge it every day! Equipped with a 3-axis accelerometer and an optical heart rate sensor, ZeTime tracks your daily activity, your sleep pattern and measures your heart rate throughout the day, allowing you to watch your performance. Its inactivity alert detects if you have been inactive for too long and encourages you to move with a gentle reminder. ZeTime displays all your smart notifications on its high-resolution color touchscreen, such as incoming call, emails, texts, social media and calendar event. With just a quick glance, you can keep up-to-date with all the information that matters to you. ZeTime can be used as a remote device, allowing you to take pictures, play, pause, and skip tracks directly from your wrist. ZeTime has also a “find my phone feature” which makes the phone vibrate or ring to find it easily. ZeTime seamlessly connect to iOS and Android smartphones by Bluetooth. Download the free app to set up your smartwatch, sync your activity and sleep data, choose the notifications you want to get at your wrist, download exclusive watch faces and more! Mechanical hands with smart movement, full round TFT color touch screen, 30 days battery life, 5 ATM water resistant. Sapphire glass, stainless Steel case, smart crown navigation. Activity tracker, heart rate sensor, sleep monitor. Changeable watch faces, quick release wrist bands. IOS 8+ and Android 5.0+ smart app, USB magnetic charger. If you have any questions about this product by MyKronoz, contact us by completing and submitting the form below. If you are looking for a specif part number, please include it with your message.